Dr Paul Widdop, along with colleagues at the University of Konstanz (Prof. Ulrik Brandes); the Mitchell Centre (Prof. Martin Everett); and Alliance Manchester Business School (Prof. Adam Leaver) examine the structure of the transfer system of the English Premier League from 1992 – 2015; and professional clubs position in it. Evidence shows that trading patterns are not random rational acts; rather, they show a more highly structured network with differing levels of power and centrality. A recent FIFA report highlighted the significance of the global trade network in ‘Association Football’. Indeed, football clubs around the world spent a record $4.1bn (£2.7bn) on international player transfers during 2014. A significant proportion of this £2.7bn is accountable to the English Premier League (EPL). In total England was the world’s biggest spender in 2014, with its clubs paying $1.2bn (£795m) during the year. Furthermore, with the recent signing of new broadcasting rights 2016-2019, EPL clubs are set to share £8.3bn TV windfall, this has major implications not only on the international transfer market system but also the domestic one. In this study we take a historical approach to the macro trading system to uncover patterns of connectivity, whilst also examining clubs position within the structure and what this means to their success and failure. For clarity, this is a study of the domestic transfer system. The research is ongoing, but this overview gives good insight into how this system operates and the fragility of some clubs within its dense structure. 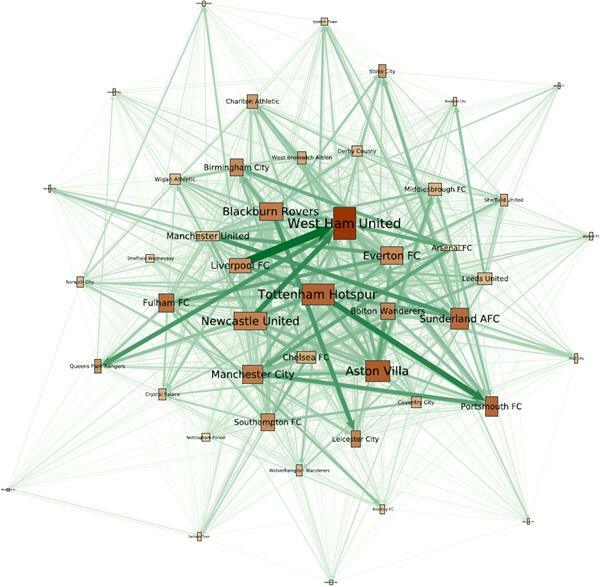 A good way to measure and visualise this system is through a network analysis approach, where links are forged between football clubs through trade in players. Furthermore, if we examine each EPL club and its transfers, whilst also identifying trading links between them, since the formation of the premier league the result would be a network: the EPL Trade Network. Before we highlight our initial results, there is a need to put the graph (network map below) into context. The nodes (squares or rectangles) represent football clubs, the line linking the two is an edge, an edge represents a transfer between clubs. The direction of the edge (arrow) represents which way the transfer (player(s)) flowed – seller to buyer. Furthermore, the node height and width is weighted in and out-degree (in = incoming transfers; out =outgoing transfers; where degree means the number of ties that a node has). Edges are sized by number (sum) of transactions between two clubs, that is, the more transfers between the same clubs the greater the size of arrow (edge). As can be discerned from this basic sociogram, a complex network structure exists. We identify six points to think about in this brief insight into this trade network. First, there is evidence of a core periphery structure. That is an inner highly connected core and loosely connected periphery. Second, although they share geographical propinquity there is little trade between clubs that operate in the same foci; this is especially true in the North West of England. Third, one pattern that emerges is the trade flow or indirect supply chain between Liverpool or Newcastle United via West Ham United to Queens Park Rangers. Fourth, of all the clubs operating in this market, perhaps West Ham United have the most obvious stability issues, in that there is constant trading in and out of the club. Fifth, successful teams in this time period are relatively small players in this domestic market, they are more dependent on the international global world system and are therefore less involved (net senders are wider than they are high). Finally, domestic trading may not equate to success but it may equate to an ongoing sustainability and maintenance of position. As identified this is our basic sociogram of the domestic transfer system in England, as part of our wider project we are also exploring other networks which include, the global transfer system; manager and directors; managers; agents, super agents and players/managers. Finally, we are also exploring the flow of money and resources in these systems.